A giant inflatable chicken balloon depicting the president of the united states was spotted sailing around the sea! 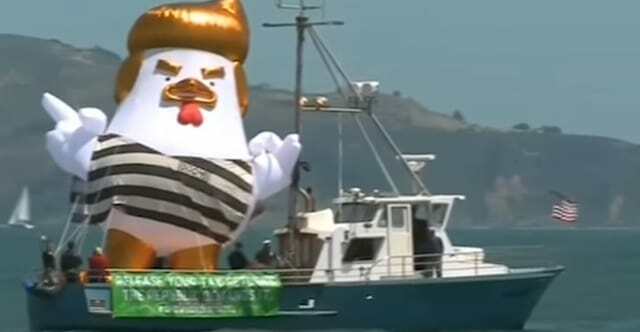 The Trump chicken is back and was spotted sailing around the bay this Sunday. This 33-foot-tall inflatable 'Chicken' is created by Trump protestors who wears a striped prison uniform and is often called 'Prisoner 45', Trump being the 45th president of the United States. According to The Independent, the Trump chicken first caught everyone's attention last year during the San Francisco Tax March, held on April 15, 2017, and even came to the White House last August. 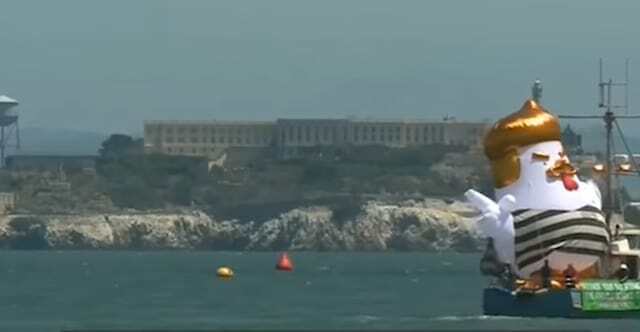 Earlier this year the chicken was spotted on an "Alcatraz prison transport" boat near the prison island. 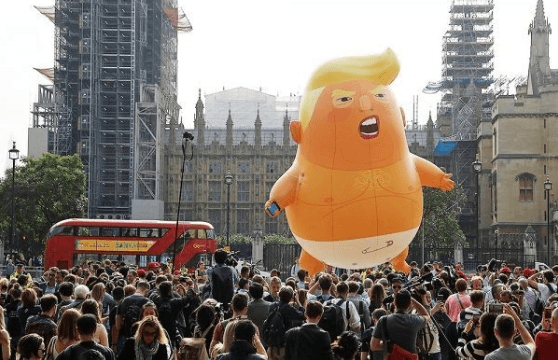 A 20-foot inflatable "Trump baby" blimp, with an orange diaper, holding a cell phone, was also seen in the UK recently, during the president's visit. These balloons, a project by Trump Chicken and funded by multiple crowdfunding campaigns, are a symbol of peaceful protest against Donald Trump, the president of united states. The recent prisoner trump chicken incident is said to be a reaction to the Trump-Putin meet last week. 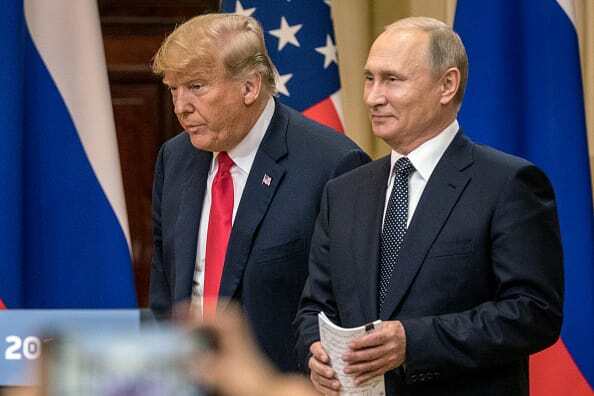 "After the week the world has had, we all want to see Trump in jail. Yet we know the wait is long, too long. In the meantime, how can we let out our frustration about everything that seems so ruined and wrong? We at Trump Chicken are civic-minded. 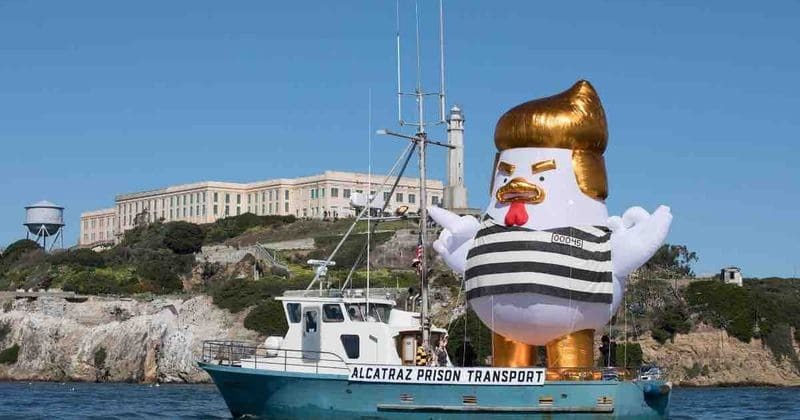 We want to give you a chance to speak your piece to the Chicken President when we sail our 33-foot bird in his Prisoner45 shirt slowly down the Embarcadero and further south this Sunday 7/22 in a prison transport boat. As he sails past, you can say anything you want to President Chicken. You can mock and squawk and swear like you’ve never sworn before in a proud expression of your First Amendment right. Bring your friends." - reads Trump Chicken's GoFundMe page. The organization is still running strong and most of their crowdfunding campaigns go so viral, they're left with excess money. The internet loves Trump Chicken! It may be done sailing for now but it surely will return in the future, sooner than you think.